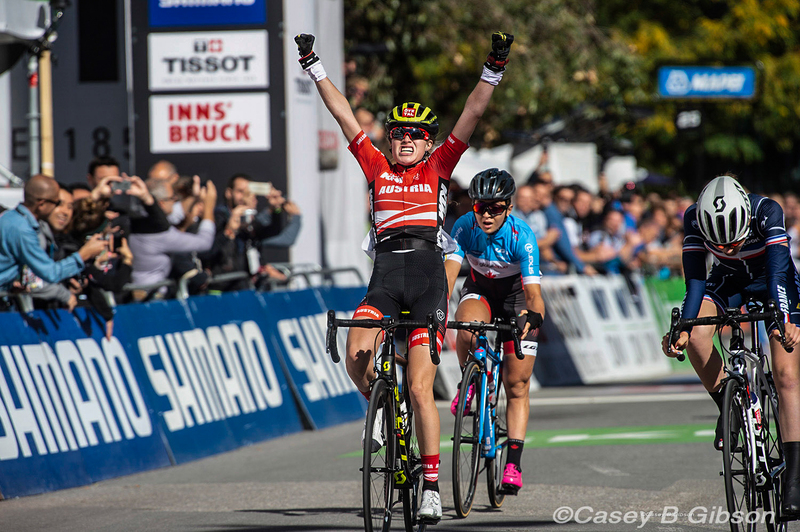 Simone Boilard of Quebec City won Canada's first medal of the 2018 Road World Championships in Innsbruck, Austria, on Thursday in the Junior women's road race, finishing third in a four rider sprint for the title. It is Canada's first medal in the Junior women's category since Clare Hall-Patch of Victoria also won bronze in 2000 - the year Boilard was born. 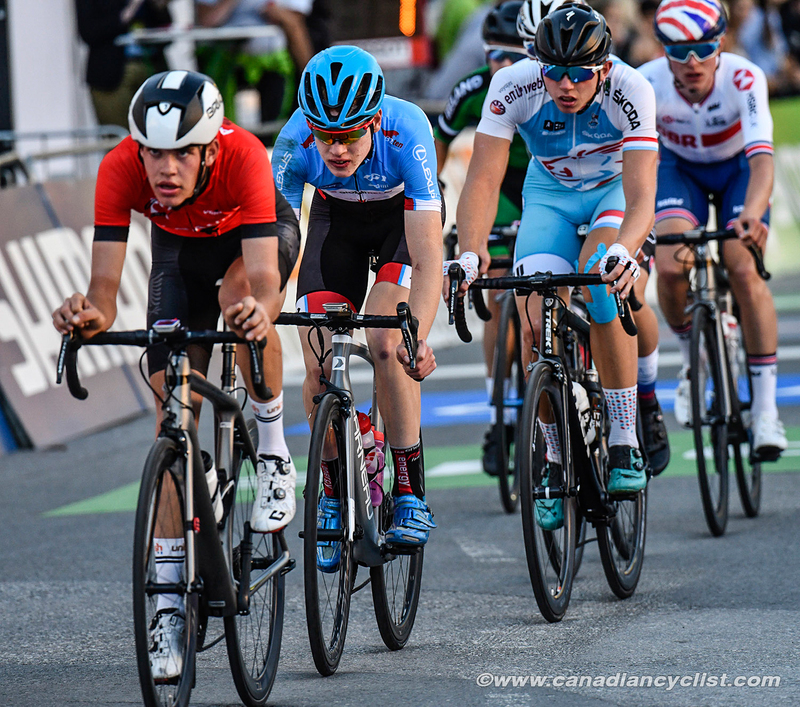 Canadian Junior men did not fare as well as the women in their 131.8 kilometre race, with all five riders caught in or behind a series of large crashes in the peloton before the first climb. The top Canadian finisher was Thomas Schellenberg in 46th place. The only other Canadian finisher was Canadian champion Ben Katerberg in 71st place. 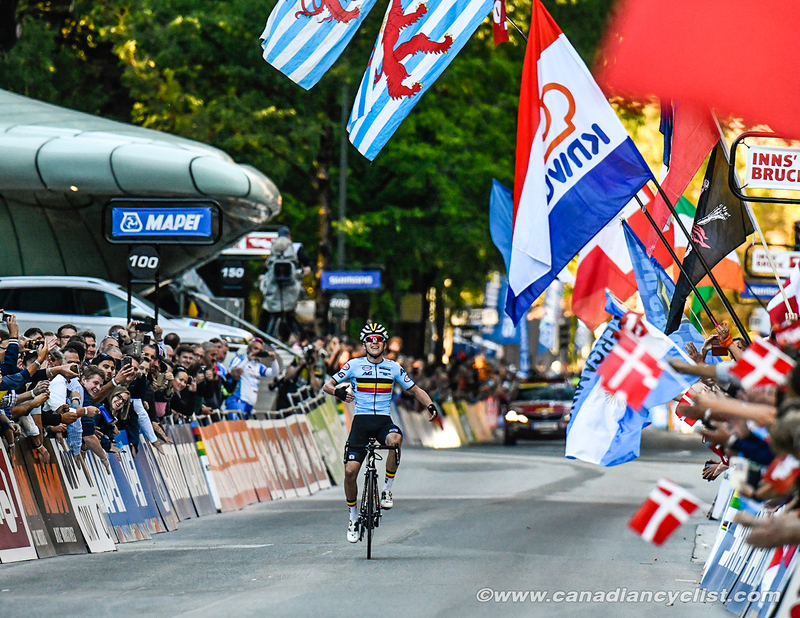 The 71.7 kilometre women's race featured two long climbs that split the field. 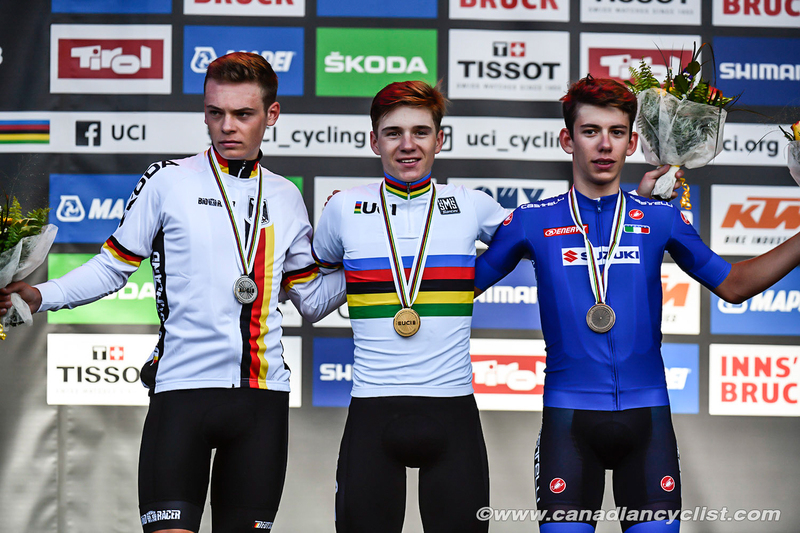 Both times, Boilard, the Canadian time trial champion, was among the leaders. 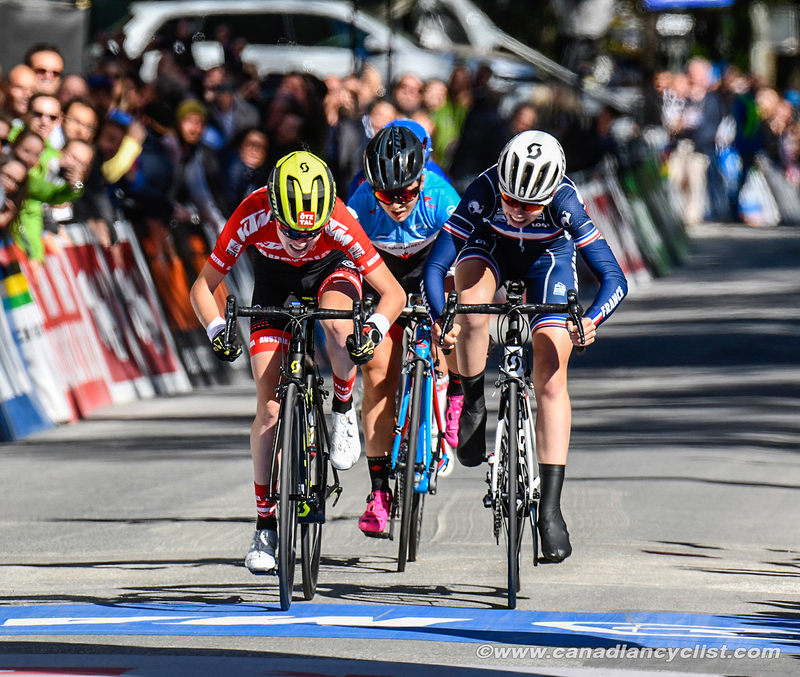 While much of the field regrouped after the first climb, the second one saw multiple attacks that whittled the lead group down to three - Boilard, Laura Stigger (Austria) and Barbara Malcotti (Italy). Boilard was dropped by the other two a couple of times on the long descent, but always fought back to the leaders. Coming into the final two kilometres, Marie Le Net (France) bridged across, making four for the final sprint. Stigger, who recently won the mountain bike world title, attacked with 100 metres to go, holding off Le Net at the line, with Boilard coming in at the same time for third. 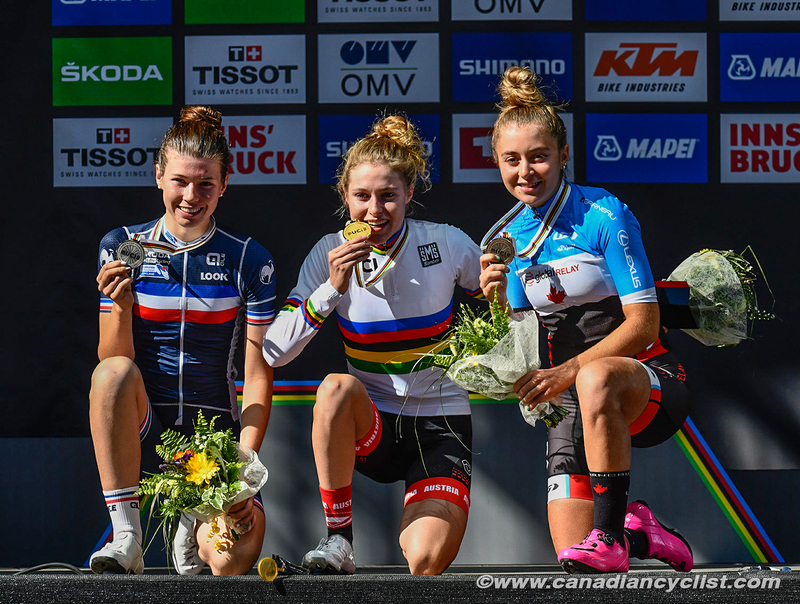 "I was happy with my ride in the time trial [where she finished fifth], but I knew I could do better," said Boilard, "so I really wanted this medal today. Coming to the Worlds I didn't know about any of the other girls because I didn't have any Worlds experience. But the attacked of [Stigger[ was really decisive, and I saw the Italian following her, and I thought, 'this is it, I have to push'. I had to push really hard to catch them because it was a big gap to close. So it was three of us and then the French girl came back, and I thought 'I want a medal so I have to do something'. I was cramping, but I gave everything I had to win this medal." "I know I have some work to do; I was not the best in the descent and I have some tactical work to do as well. Usually I just go really hard and it works, but it is hard to make decisions in the race and I'm not used to it. So I need some more experience if I want to be one of the best in the world. I'm really proud of myself, but I also see that I have some work to do for the future." 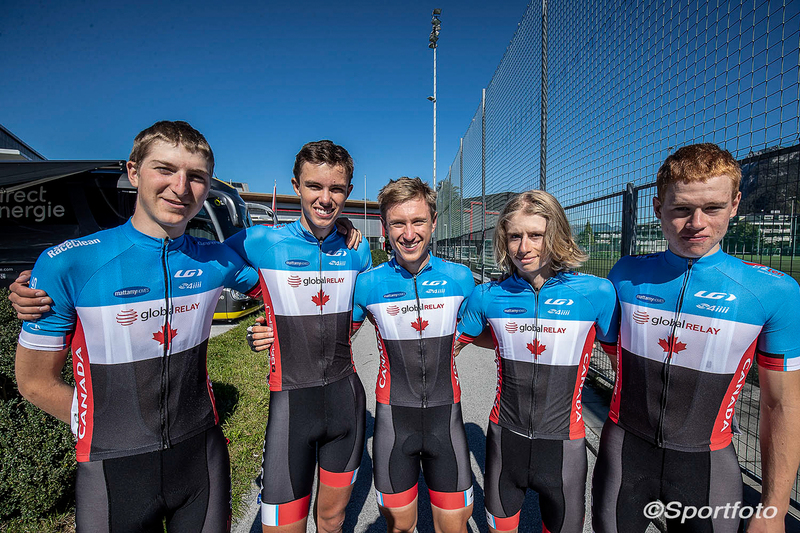 In other Canadian results, Magdeleine Vallieres Mill was 38th, despite riding with a broken thumb from a crash in the time trial, Kaitlyn Rauwerda was 48th and Elizabeth Gin 73rd. 4 Barbara Malcotti (Italy) all s.t. 6 Vittoria Guazzini (Italy) s.t. 16 Veronika Jandova (Czech Republic) all s.t. 19 Hannah Ludwig (Germany) both s.t. 22 Desiet Tekeste (Eritrea) s.t. 41 Lina Svarinska (Latvia) all s.t. 55 Anya Louw (Australia) all s.t. 59 Petra Machalkova (Slovakia) both s.t. 62 Noemi Ruegg (Switzerland) both s.t. 65 Julia Borgstrom (Sweden) s.t. 79 Tatyana Bogdanova (Kazakhstan) all s.t. 81 Britney Kerr (New Zealand) s.t. 88 Emma Christensen (Denmark) both s.t. 90 Nina Berton (Luxembourg) s.t. 93 Amelia Sharpe (Great Britain) both s.t.